Asparagus is available year-round, but spring is the best season for this nutritious vegetable. Crops are harvested from late February to June, with April being the prime month and high season for asparagus. By the end of May, asparagus is at the end of its season in most locations. The stalks shoot up from the crown of the plant and grow into fern-like leaves when they are allowed to develop. However, the edible stalks are harvested strictly by hand before the actual fern leaves develop. You have to be patient to grow your own asparagus: It takes three years from the sowing of the seed to the harvest of the first stalks. Asparagus is one of the few vegetables that is grown as a perennial since the plants have about a 10-year life. The plants are either male or female. The female produces seeds, which not only reduce the size of the stalks but also crowd the beds with seedlings. Since the males do not expend energy making seeds, their stalks are larger and more desirable. New cultivars have been bred to produce only male plants for more cost-efficient crops. Asparagus comes in the following grades: colossal, jumbo, large, standard, and small. These varieties are interchangeable in recipes, with the only change being in the color of the dish. Green asparagus: Most American asparagus is of this variety, which ranges from pencil-thin to very thick. White: Preferred in Europe, these sunlight-deprived stalks are a little milder and more delicate. It is difficult to find fresh white asparagus in the United States, but it is widely available canned (usually in jars). Violet or purple: This variety is most commonly found in the United Kingdom and Italy and has a very thick and substantial stalk. ​​Wild: Asparagus grows wild in some areas, particularly in Europe. You'll most likely have to hunt down your own because it is rarely available fresh in markets, except in Italy and the south of France. 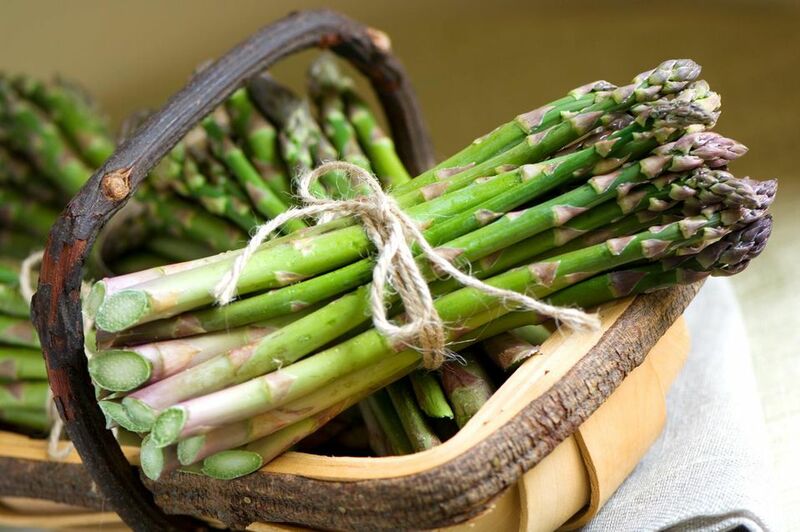 Asparagus is considered a good source of vitamin K, antioxidants, and thiamine. You don't have to spend a lot of calories to get those benefits. Three spears of asparagus are very low in calories: They add up to 9 calories and hardly need to be counted. In those three spears, you'll also get nearly 1 gram of fiber, and that's a win-win situation. There are many ways to cook this favorite spring vegetable. Its season is short, and you have to make the most of it. So serve it a few times in different ways. Roast it with Parmesan and garlic or lemony breadcrumbs; toss with dressing, almonds, and goat cheese; garnish with fava beans, lemon zest, and toasted almonds; or mix in risotto with fresh spring peas, parsley, and Parmesan. Or simply steam it and season with butter or olive oil, garlic, pepper, and Parmesan or shredded Gruyere for an easy side dish.